On the eve of Pakistan International Airlines' first jet flight from Karachi (west Pakistan) to Dacca (East Pakistan ), an earlier issued scarlet coloured stamp with a denomination of two and a half Ana in 1957 showing Karnaphuli Paper Mill East Pakistan. was over printed with words "First Jet Flight karachi - Dacca" was issued on 6th February. The stamp was repriced at 13 Paisa as in 1961 Pakistan switched over to the decimal system. 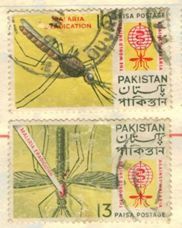 On 7 April 1962, a s et of two stamps was issued on the eve of Malaria Eradication campaign. The stamps were priced 10 and 13 Paisa. On 8 June 1962, a commemorative stamp of 40 Paisa face value was issued on the eve of formulation of the new constitution of the country. The stamp printed by Courvoisier S.A. Switzerland showed the Jasmine flower (national flower of Pakistan) and maps of East and West Pakistan. On the eve of Independence day 14 August 1962, the theme chosen was Sports in the country. The set of four stamps was priced at Paisa 7, a black and blue stamp showing football, Paisa 13, a green and black stamp showing hockey, Paisa 25, stamp in black and purple showing squash raquets, and finally a Paisa 40 stamp of black and orange brown colour showing cricket bat. 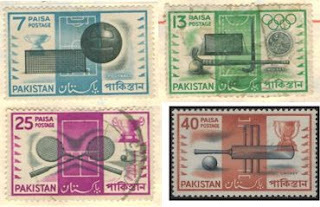 After Cape Verde, Pakistan became the second country in the world to have a stamp showing a cricket bat. Small scale industries of Pakistan are the backbone of Pakistani industry supporting the handicrafts of the country. A set of five stamps was issued on 10 November 1962. The 7 Paisa stamp in brown lake colour showed a marble fish plate, the 13 Paisa deep green stamp showed the sports industry, 25 Paisa stamp of reddish violet colour displayed the camel skin lamp, the 40 Paisa yellow green stamp the wood industry and finally the 50 Paisa deep red stamp showed an inlaid cigarette case. The stamps were designed my Munir Bhatti and Ashfaq Ghani. Pakistan continues to issue stamps on its handicrafts and other industries as can be seen in Pakistanpaedia. 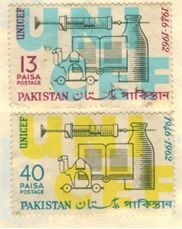 On the 16th anniversary of the UNICEF, Pakistan post issued a stamp of two stamps on 11 December 1962 as above. The stamps depicted a book, toy and medical instrument and were of 13 and 40 Paisa denomination. The earlier issued set of the definitive stamps of 1961 undergone yet another change with re-drawn Bengali inscription from the left to new inscription as seen on the stamp on the right. The change was effected to the entire range of these stamps and continued to be used till these stamps were withdrawn.